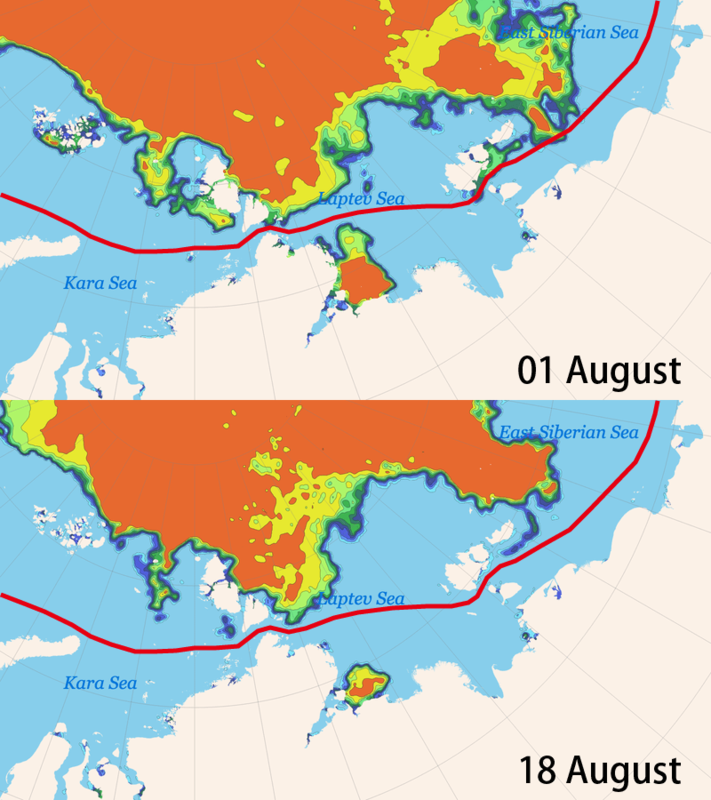 Both NSR Passages Open with Third Lowest Ice Extent Observed WNISAT-1R Launch Planned Next Summer for Arctic Data – Weathernews Inc.
Weathernews Inc. (Chiba, Japan; Chihito Kusabiraki/CEO) is announcing the opening of the Northern Sea Route (NSR) this year as of September 3rd. 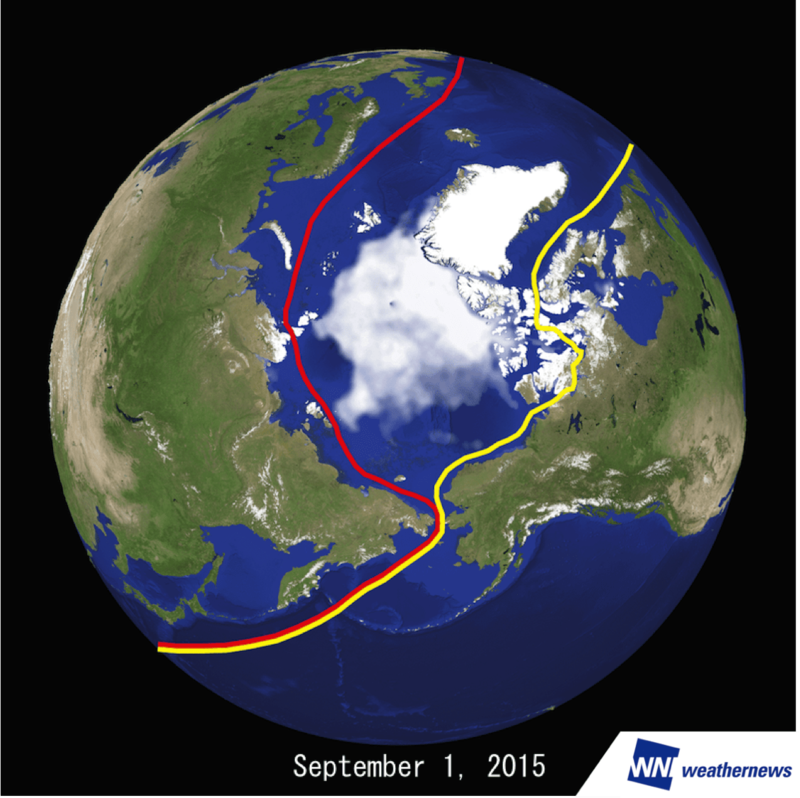 According to the Global Ice Center (GIC) at Weathernews, the northeast passage along the Russian coast has been open* to shipping traffic since August 18th, and the northwest passage across Canada has opened from September 1st, making this year the first both passages have opened since 2013. 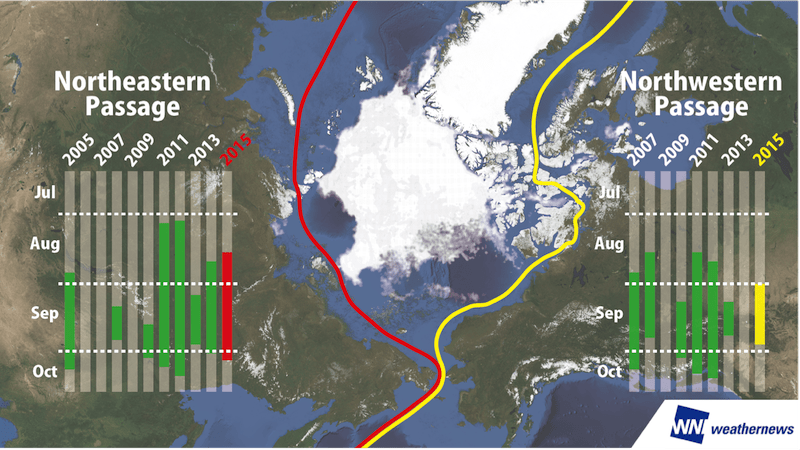 The northeast passage is expected to stay open until early October, with the northwest passage closing by late September, thus making it possible for commercial vessels to enter the icy region. This year, ice in the Arctic Sea is melting at a fast pace, already reaching the third-lowest extent observed in the NSR. However, information available on conditions in the NSR is still scarce, so Weathernews is planning the launch of the WNISAT-1R satellite in 2016 for finer data and analysis. 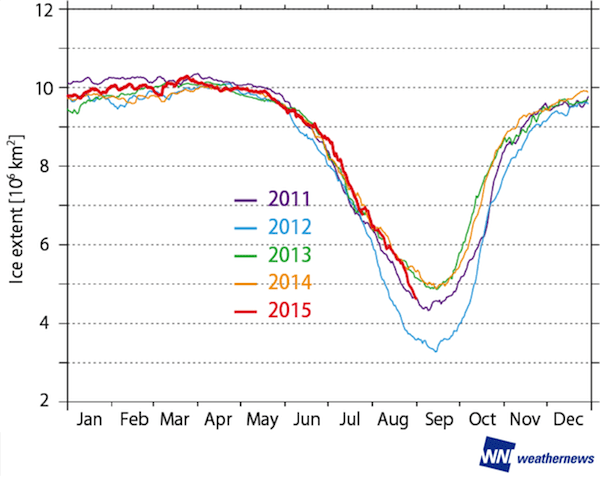 This season, ice is melting faster in the NSR than last year, opening both the northeast and northwest passages. 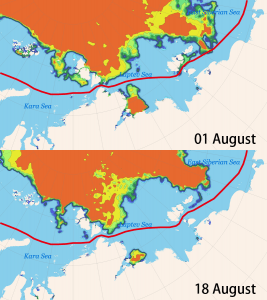 Last year, the northeast passage was obstructed by ice in the Vilkitsky Strait. However this year, ice started melting in early August with ice receding around the New Siberian Islands, fully opening the passage on August 18th. Sea ice lingering in the Barrow Strait prevented the northwest passage from also opening last year, but the faster progress of melting ice this year has opened the other passage as of September 1st. The Weathernews GIC is predicting that conditions favorable to commercial shipping traffic entering the Arctic Sea will continue for at least a month after this on the northeast side, and for about four more weeks on the northwest side. The background for both passages opening this is ice floes melting easily with the active water flux in the spring, and comparatively fair weather conditions in July and August in the Arctic region. Warm air and sea temperatures rising are considered major factors. and predictions of seasonal openings for 2015. Currently, sea ice in the Arctic has shrunken to about 4,600,000 km2, the same as observed in 2012 and third smallest area since 2007. The GIC expects ice to continue melting until mid-September when air temperatures will start to fall, and sea ice refreezes outward. 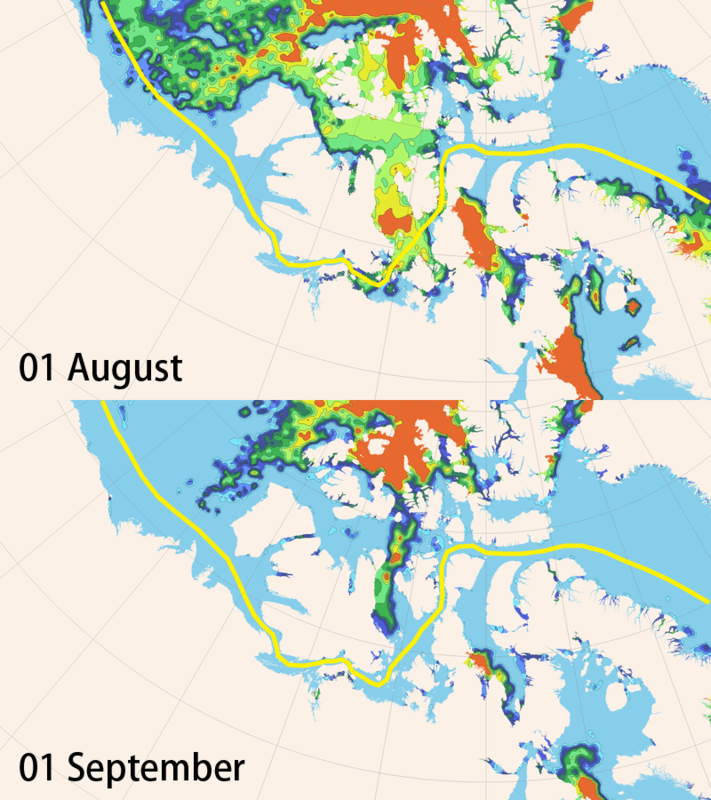 In the northwest passage where ice easily freezes over the many islands, closing is expected in the latter half of September, followed by the northeast side in October when coastal ice reappears, and closes the route. For commercial shipping companies, the trend of melting sea ice seen in recent years means they can use the NSR as an alternative to traditional trade routes on voyages from Asia and Europe. The Voyage Planning Team at Weathernews has been providing Polar Routeing Service to support customers pioneering the application of this passage since 2011. 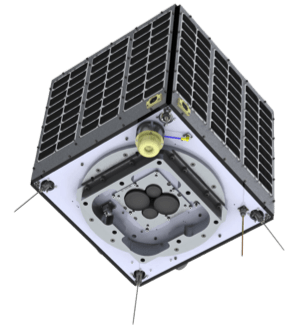 Since there is still little data available on conditions in the Arctic, Weathernews has developed WNISAT-1R, a compact satellite dedicated to ongoing enhancement of this service. WNISAT-1R will launch in 2016 for dedicated monitoring of sea ice levels in the NSR.